Martin Kerres is currently working at the Sustainable Water Policy team at GIZ, advising the Federal Ministry for Economic Cooperation and Development (BMZ) on water policy issues. Due to his background in water and climate change, he particularly focuses on the link between these two fields. Martin has specialized on adaptation to climate change during his position as Associate Professional Officer at the Inter-American Development Bank in Washington DC. Prior to that, he advised the KfW water team on mainstreaming adaptation to climate change into the sector portfolio. The ITT Research and Lecturer Series are public lectures focussing on relevant methods and topics from the fields of Water, Renewable Energy, Natural Resources and Environment Management. 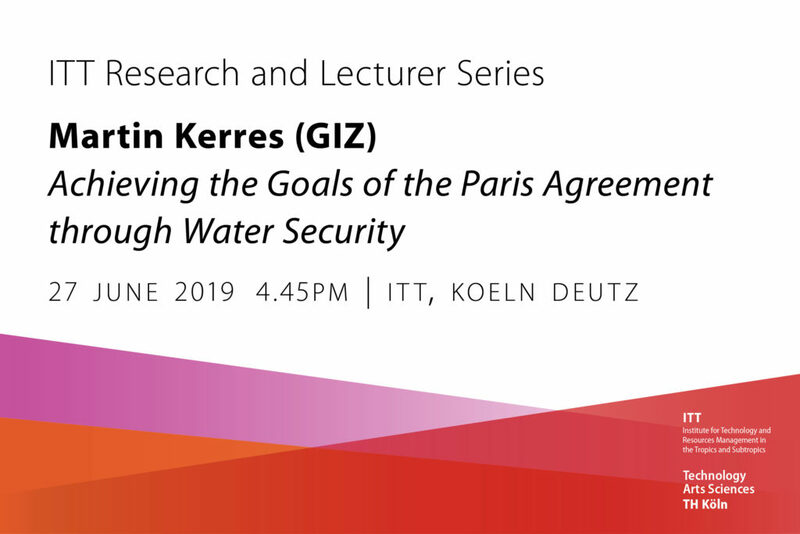 On Thursday 27 June 2019 from 4.45 – 7pm Martin Kerres, ITT Alumni, will talk about on how to achieve the Goals of the Paris Agreement through Water Security.